Deputy Health Minister Yaakov Litzman slammed the leftist Physicians for Human Rights organization over its vocal opposition to Israel's plan to relocate illegal African migrant job seekers who have plagued South Tel Aviv. Israel has offered its estimated 38,000 illegal African infiltrators $3,500 and a plane ticket if they leave by March, warning they may face arrest after the deadline. Israel's left-wing has launched a publicity blitz in response urging the government to let them stay on humanitarian grounds, arguing mendaciously that Israel is effectively sending them to their deaths by transferring them to a third country. Prime Minister Netanyahu pointed out that the UN has placed 180,000 refugees in Rwanda, one of the countries willing to accept the infiltrators who leave Israel. As part of the campaign, the Physicians for Human Rights issued a petition calling on the government to scrap its deportation plan. "Anyone with a heart must oppose the expulsion of refugees" read the missive, although none of the few bona fide refugees among them are to be relocated. 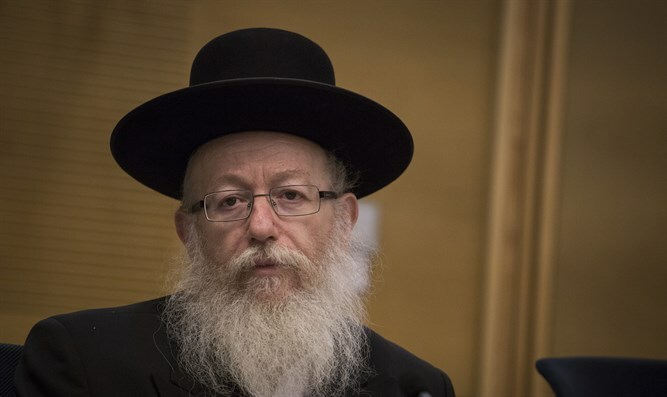 The petition left Litzman fuming at the doctors who signed the appeal. "I was shocked to see a letter from medical professionals protesting the removal of infiltrators from Israel, especially their claim that removing the infiltrators violated the Hippocratic Oath," wrote Litzman in a letter to the Immigration and Population Authority's Director General. "I would like to protest against these remarks, which in my opinion as deputy health minister, do not represent the health system in Israel." Deputy Minister Litzman attacked the doctors, who he alleged are hurting Israel's image. "The attempt, in my eyes, to paint the signatories (of the petition) as compassionate and the proponents of the deportation policy as evil people who are cruelly expelling asylum seekers is despicable and dishonest" continued Litzman. "Every sovereign state acts to remove foreigners who are staying on its soil illegally, " added Litzman. Politicians have begun to push back after last week's media onslaught, citing the skyrocketing crime rate in South Tel Aviv, where the majority of infiltrators live. "It would be immoral for us to flood Israel with job seekers. We are not an employment bureau [for Africa]. This is a responsible and reasonable policy," said Education Minister Naftali Bennett.